Ospreys chairman Roger Blyth claims the region's feeder clubs in the Welsh Premiership have fallen victim to the demands of player development. 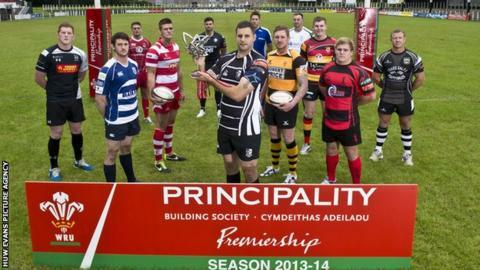 Bridgend, Aberavon, Neath and Swansea - all under the Ospreys' umbrella - prop up the 12-team Premiership table. Swansea staved off relegation with a 40-0 win over Aberavon on Wednesday night but remain favourites to go down. "When you look at the table you can say 'yes', our four clubs are at the bottom," Blyth told BBC Radio Wales. "But in terms of developing players I think all four clubs have played a massive, massive part. "Some examples from all the clubs: you look at young Dafydd Howells in Neath; you look at Justin Tipuric and Ashley Beck from Aberavon; Tom Habberfield and Rhys Webb from Bridgend; Eli Walker and Dan Biggar from Swansea. "These are all fairly recent players, that's without the ones that have gone before them. "It's sad but I think where Swansea have come a little bit unstuck is when these players haven't been available, they haven't had the depth of players to cover them. "They've been unavailable for very good reasons - Wales squad training, the Under-20s etc." Swansea are historically one of the major clubs in Wales and the St Helen's side celebrated their 140th anniversary in 2013. The All Whites were the first Welsh side to claim the scalps of all three 'big' southern hemisphere teams - beating Australia in 1908, South Africa in 1912 and completing the hat-trick in 1935 with an 11-3 win over New Zealand. Australia have fallen twice more to Swansea in 1966 and 1992 - when the Wallabies were world champions - while New Zealand were held to a 6-6 draw in 1953. But despite that illustrious history and a steady stream of players who have gone on to represent Wales and the British and Irish Lions, Swansea are now at arguably their lowest ebb. "There was an edict from the Welsh Rugby Union about the raison d'être of the Welsh Premiership and it was to support regional rugby," Blyth added. "In fairness to Swansea - and all the other Premiership clubs in our region - they've been faultless in that regard. "They've played a lot of up-and-coming players and maybe as a result of that they've suffered a bit. "They've certainly played a massive part in the development pathway we have, and that applies to all the clubs in our region. "If you look at this particular side at the moment they'll probably have five players who are attached to Swansea who will be in the Wales Under-20s squad for the World Cup [IRB Junior World Championship] this year. "They've done what's been asked of them, but they're suffering now in their league position."